Although the Vancouver and Portland metro area weather is more moderate compared to frigid east coast winters and blazing hot summers in the south, it can dramatically affect the efficiency of HVAC systems. One of the most important factors to take into consideration is the amount of moisture in the air, otherwise known as humidity. Humidity can make the summer air feel even warmer, and the rainy season in the winter makes it feel even colder. When it’s cold outside furnaces and heat pumps work even harder to compensate for the temperature differences. Even milder winters in Portland and Vancouver cause people to turn the heat up on their thermostat, and fire up the furnace, which is why regular HVAC maintenance is important. Moisture is an important factor to consider when managing indoor temperatures and maintaining an HVAC system. Water can get into small spaces where it can corrode or freeze, and damage components. Protect systems by covering exhaust and intake pipes, valves, coils, and by removing debris from ducts. Pipes, valves, and coils can freeze or break, causing a furnace to shut down and leave a home without heat in the middle of winter. An easy method of maintaining HVAC efficiency is by selecting the best thermostat settings for a specific space. Programmable thermostats can switch between modes on a set schedule, adjusting to the temperature that is most appropriate for the time of day. 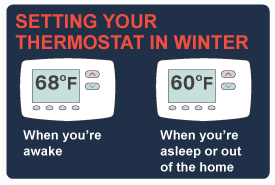 Turning the temperature down when no one is home saves energy by preventing unnecessary heating and cooling. Thermostats may also have an adjustable cycle, which prevents HVACs from frequently turning on and off to try to stabilize the temperature. When the temperatures start to climb, older, less efficient air-conditioning units have trouble cooling inside air. Portland has many older homes, which commonly have less insulation, less efficient ventilation, and older air conditioning units. In these homes it’s more difficult to control the temperature and humidity due to poor circulation. Summers in Vancouver and Portland aren’t the hottest in the nation, but the increase in temperature prompts people to want to cool down and use their AC units, and the humidity makes it feel even warmer. Humidity doesn’t just make the air feel hotter and heavier, it also interferes with the transition of heat during the cooling cycle, reducing the effectiveness and efficiency of AC units. The air-conditioning cycle involves the circulation of a refrigerant: a fluid that transitions to a gas or vapor that absorbs heat from the desired location and transfers it outdoors. Air conditioners work harder when temperatures climb. This is because the air-conditioning cycle requires the outside temperature to be lower than the heat being released from the unit. You can reduce the humidity in an area by opening doors and windows to increase air circulation, remove carpeting, which holds moisture and heat, or reduce the number of plants in a space, which increase the amount of moisture in the air. AAA Heating and Cooling can determine the best maintenance for your current system, or what kind of upgrade is best for your home or business by providing seasonal inspections. It’s important to perform routine maintenance and inspections on HVAC systems to ensure it is in proper working condition and prepared for the upcoming season. Don’t let the mild weather in Portland and Vancouver fool you – humidity and temperature fluctuation can affect your HVAC efficiency.